1. Ordering and payment of the Hospital or Institution subscription is available at www.musicurestream.com - click 'subscribe' and enter information - click 'approve information' and proceed. 2. When ordering and entering of your information has been completed, you will receive an email with 'User Name' and 'Password' as a new subscriber, and a link to the 'Login' page of Streaming MusiCure. 3. Then, as a new subscriber, you will be given a one-month free trial of the subscription, which after the 30 days period automatically transfers to payment, with pre-payment of 6 months subscription for institutions, and monthly payment for private users and independent therapists. 4. Payment can be done with all major credit cards. 6. The user interface showing all 4 MusiCure Streaming channels now opens and provide direct access to all four channels. 'Institutions subscription' allows up to 50 users with the same 'Username' and 'Password', and a 'Private subscription' for private users, independent practitioners and clinics gives access to the channels in a similar way, but only for 1 user (on three different units). Send us an email to: contact@musicure.com with clear with clear indication of your name name and your email address used when you made the subscription, simply stating: "I want to terminate me subscription" - you are also very welcome to give us the reason for the termination. As a subscriber, you can always access your account by clicking on the 'wheel' next to your name at the top right of the page and find account details, edit password and read our FAQ section with frequently asked questions. All streaming requires a good and fast internet connection. Like other established streaming services, such as Netflix, HBO and others, are the streaming done in real time and it is therefore recommended to use an internet connection of at least 5-10 megabits per second or more. The MusiCure channels can be streamed and viewed individually so that you can choose between all 4 channels at your convenience. All content is stored and streamed from a central server and delivered directly to a hospital department's TV screens or audio system, and other private digital media, such as iPhone, iPad/Tablet, etc., which are activated by the same username/password. The MusiCure music channel contains specially designed music programs with content from the entire MusiCure series as well as new content with carefully edited 'breaks' in the music stream, where nature sounds are in focus. The 'MusiCure Procedure' contains specific timed treatment programs, as well as meditations, power-naps and wave therapy programs. 'MusiCure Nature Film' contains pure soothing and inspiring sceneries, recorded, cut and edited to MusiCure music. The films are calm atmospheres from nature, completely without speech or other disturbing elements. All films are newly produced in HD and have not previously been released. The Night/Sleep channel consists of an 8 hour long course of soothing sounds of ocean waves - and 2 x 15 minutes specially edited MusiCure music for falling asleep and awakening. NOTICE: The MusiCure Music and Nature film channels are programmed for playback in 'loop' and will so resume automatically after the last music or film sequence is completed. The night channel automatically ends after 8 hours of music and soothing sounds of ocean waves. The procedure channel has fixed durations and is not looped. 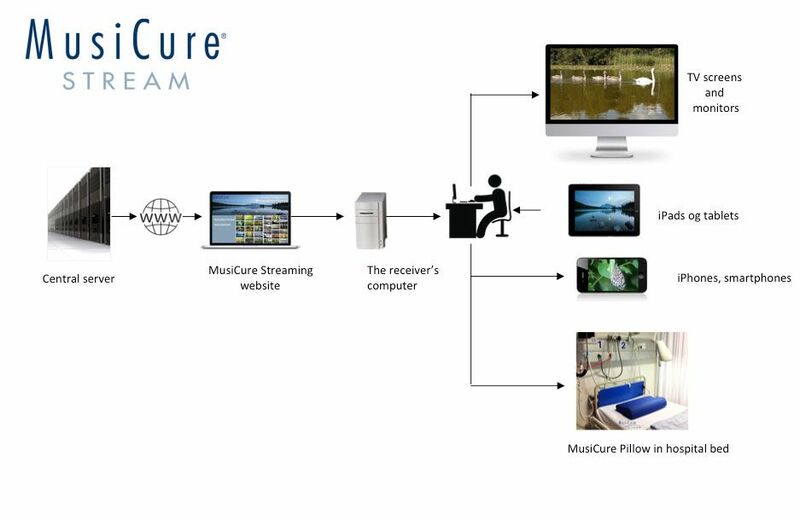 Graphical example of the solution for streaming music and films to hospital and care facilities departments and waiting rooms. The MusiCure channels are stored and streamed from a central server and delivered directly to all department's TV screens or other private digital media, such as iPhone, iPad / tablet, etc. via a subscription with username and password.